Evan has just tweeted out another photo of the S8 in the Black Sky and Orchid Grey colors. Both look gorgeous, but the Orchid Grey in particular looks incredibly unique. Technology leaks aren't uncommon in the first place, but pre-launch pictures and information regarding Samsung's upcoming Galaxy S8 and Galaxy S8 plus in particular have been hugely abundant. We've seen press shots, we've seen live pictures and videos; hell, we've even seen leaked documents from other devices confirming some highly-anticipated features. Now, serial leaker @evleaks has spilled some more pictures of the S8 lineup, as well as some pricing details. In this picture, we can see both the 5.8" S8 and the 6.2" S8 plus. 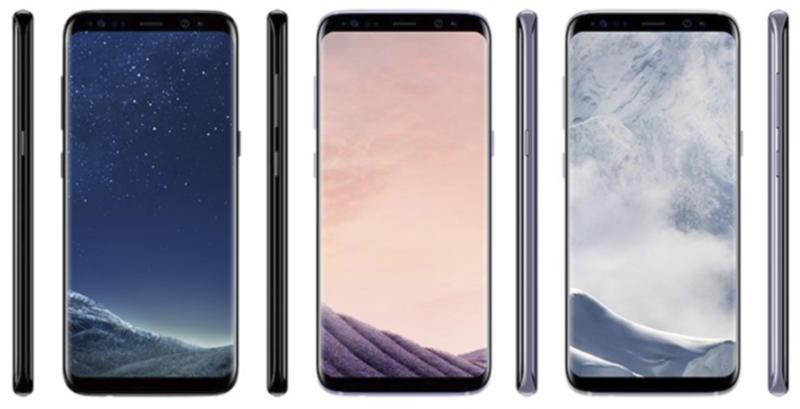 The S8s are on the top row, while the S8 pluses are on the bottom. It would've been pretty hard to distinguish them without Evan's description, but the S8 plus, like most larger variants of phones, has slightly smaller bezels than the standard S8. The 18.5:9 aspect ratio is apparent here, as are the lack of a Samsung logo (finally!) and hardware keys, the rounded edges, and the slightly curved screens. The colors, from left to right, are Black Sky, Orchid Grey, and Arctic Silver. Black and silver are pretty standard smartphone colors, but Orchid Grey appears to be the rumored violet color. Also worth noting is the black S8's darker frame, which we saw on the Black Onyx Note7 (RIP). And while they might not be to everyone's tastes, the black fronts on all three color choices make the bezels appear even smaller than they are - a smart move on Samsung's part. They also hide the wide array of sensors and allow for a more immersive experience. Can you tell that I like black fronts? Shortly after tweeting that photo, Evan also spilled the beans on European pricing for a variety of upcoming Samsung products: the Galaxy S8, the S8 plus, the DeX dock, the updated Gear VR, and the Gear 360. The Galaxy S8 will cost 799€, with the S8 plus costing 100 euros more at 899€. In comparison, the Galaxy S7 and S7 edge retailed for around 700€ and 800€ at launch, respectively. Essentially, we're seeing a price hike of around 100 euros per device. These prices can't be directly converted into USD, but we'd expect to see a price hike stateside as well. The DeX dock, which allows for your S8 to connect to a monitor and create a new desktop environment, will reportedly cost 150€. The new Gear VR with motion controller will go for 129€, and the Gear 360 for 229€. It's not immediately clear if the Gear 360 in reference is some sort of second-generation model, but considering the current-gen Gear 360's price of 349.99€, it's more likely that this is simply a price cut. The Galaxy S8 will be revealed in all its glory in just ten days on March 29th. Even though we know virtually everything about it at this point, it'll still be exciting to see the phone in official guise. Evan has just tweeted out another photo of the S8 in the Black Sky and Orchid Grey colors. Both look gorgeous, but the Orchid Grey in particular looks incredibly unique. Much want.